A few months ago, thanks to Instagram, I came across an awesome Etsy shop called Jumping Jack Apparel. The shop features graphic tees, headbands, and prints for moms and kids. Unfortunately, or fortunately for our bank account, headbands and Hannah’s noggin don’t cooperate quite yet so I haven’t had to make the painfully difficult decision of which ones to purchase. I wanted to buy one of everything but finally settled on the “I Believe” tee and the gray “Favorite Reason” tee. The shirts are super soft and the screen printing has handled multiple washes without fading or cracking. I’ve received a bunch of compliments on both shirts, one young woman telling me “you are my favorite reason to never give up” would make a great tattoo. My name is Sarah and I created Jumping Jack Apparel in honor of our son Jack. 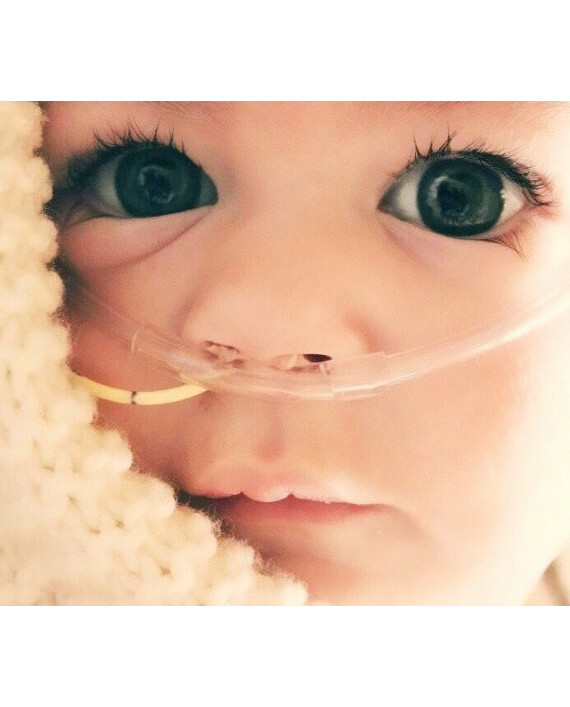 He was diagnosed with SMA or Spinal Muscular Atrophy, at just 6 weeks. My husband and I (unknowing at the time) carry the gene responsible for SMA. SMA is a genetic disease affecting the part of the nervous system that controls voluntary muscle movement. Jack became weaker each day. He never held his head up, and eventually lost the ability to cough, swallow, eat and breathe. He never sat up, he never took his first steps. He never said “Mama” or “Dada”. In the beginning we made tag blankets and crinkle toys since Jack was able to hold them with his weak muscles. We sold them on our Easy site as crafting was very therapeutic for me. The first headbands we made were also for Jack to help hold his oxygen and feeding tube in place. Jack took his last breath in my arms at 6 1/2 months old. He is the bravest boy I know. Is that not the most beautiful face you’ve ever seen? You can learn more about SMA here. $5 from every “Favorite Reason” tee is donated to the Gwendolyn Strong Foundation, a nonprofit dedicated to raising awareness of SMA, funding research, and providing support to families. You can find Sarah’s Easy shop here. She’s also on Instagram @shopjumpingjack and on Pinterest.